Most people know they need to brush twice a day, but many people skip flossing or floss infrequently, which is just as important as brushing. Flossing helps remove the plaque that develops between teeth and along the gumline where it can be difficult or even impossible for brushing alone to remove. Nylon floss and plastic floss are generally the best choices. They are available in waxed versions, which can be easier to slide between teeth and particularly teeth that are closely spaced. Flavored flosses are available but do not increase the effectiveness of the floss. Special flossing instruments, such as floss threaders or floss picks, are also available and can be beneficial for those with braces, dental bridges or other dental appliances. Hold about 18 inches of floss between your forefingers and your thumbs, and wrap one end around one of your forefingers until you have about an inch of floss between your fingers. Slide the floss between two teeth and gently slide it back and forth along the curves of your teeth and along the gumline. Unwind fresh floss and wind up the other floss as you move to the next tooth, and repeat for each set of teeth. Flossing may be painful and even trigger slight bleeding if you have never flossed before. This is generally because your gums have become sensitive due to the presence of bacteria. Daily flossing will help your gums adjust and become stronger and healthier. 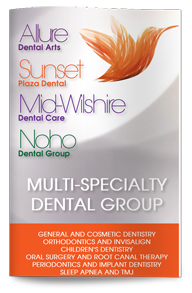 Contact our West Hollywood dentist today to learn more or to schedule your next professional cleaning.